Designer dogs are a relatively new thing to dog breeding. We’re not talking ‘new’ within the past few years, but if you compare these dogs to the thousands of years we’ve had dogs as companion animals, it’s like designer dogs are hot off the runway at New York Fashion Week. They come with weird names, too. Similar to mashing up celebrity couple names into one title, designer dogs do the same: labradoodle (lab and poodle), puggle (pug and beagle), maltipoo (Maltese and poodle), cockapoo (Cocker Spaniel and poodle), pomchi (Pomeranian and chihuahua), you get the idea. Celebrities are also linked to these dogs’ popularity. In September, Paris Hilton paid $13,000 for a teacup Pomeranian that weighs 12 ounces. 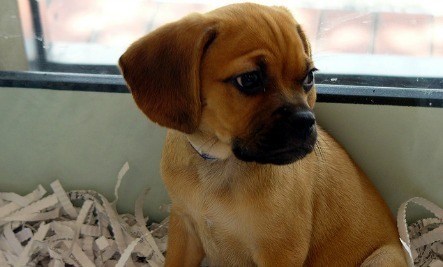 Julianne Moore has a puggle. Ashley Judd has a cockapoo. The problems he refers to are how designer dogs’ creation has contributed to the rise in shelter populations, irresponsible breeding and feeding puppy mills. Essentially, people are plopping down hundreds of dollars or even more (a morkie puppy can cost up to $2,000) for mutts. If you want to get technical, the term ‘mutt’ means a mixed-breed dog, just like the designer dogs people pay high prices for. Unlike mutts, however, these designer breeds are sometimes subjected to years of inbreeding in order to get desirable traits. After years of this type of breeding, however, dangerous health problems start to be bred in. Similar to purebred dogs, the focus for these designer dogs is on breeding to meet demand and making as much of a profit as possible. This is where dangerous breeding and cruel and unsanitary puppy mills come into play. The more popular these dogs are, the less likely these practices will be put to an end. The other issue with these designer breeds is it floods the — for lack of a better term — dog market. On top of the purebred breeders that already exist, these new designer dog breeders pop up and create more litters. The obvious problem with this is the already staggering homeless animal statistics. According to the World Health Organization, there is an estimated 200 million stray dogs worldwide. On a smaller scale, the Humane Society of the United States estimates 6-to-8 million companion animals entering shelters every year, with 2.7 million of those animals euthanized. In the United Kingdom, research done by Dogs Trust found that on average, 21 dogs are put down per day. Breeding these designer dogs only adds to the volume of dogs brought into shelters across the world. There are now even rescues dedicated to puggles, labradoodles and other sought-after designer dogs in addition to the millions of dogs in shelters. The best way to choose your next companion in a conscious manner is to adopt from a shelter. If your heart is completely set on a designer dog or purebred dog, however, instead of contacting a breeder, search to see if there are any rescue organizations near you. At least stop by the shelter to get a look. According to HSUS, 25 percent of all shelter dogs are purebred. Or you could just come across one you fall in love with instantly. Either way, the best thing to remember is always adopt, don’t shop. get a healthy breed that has not been bred twisted to a strange shape. "Breeders" are designing very expensive mutts that people USED to adopt from animal shelters. There ought to be a law against "designer dogs". We need to leave nature alone. Why do we think we can do better then the natural occurrence? Designer animals should be outlawed. Designer dogs (or whatever animal) should be banned. ADOPT, DO NOT BY PETS! !